most deserving of your attention. Downhill putts are the least forgiving of all putts. 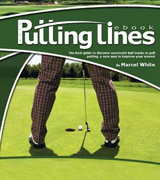 Before you putt you must know how to manage the speed of your ball as this will affect the extent of the overall break. Of all the putts you face, the ones that move down a slope are the most difficult to judge both the speed and the break accurately. They lead to many 3-putts. Ben Hogan wrote in Power Golf that he tried to place the ball below the hole when chipping. He didn’t want to putt downhill if he could help it, because he was apt to have another putt about the same distance coming back. The average golfer is happy to find the green with his or her ball. It is only when your skill levels improve that placement of the ball on the green become an important consideration. As greens are built with slopes and undulations to drain off the water, your putts will be uphill, sidehill, or downhill. Some, however, may appear level. The degree of slope on the green will vary - influencing the speed at which your ball will travel over the grass and consequently the amount of break. In looking at a hole that is cut on a slope, the rim on the top side will be slightly higher than the opposing rim. This means that for an uphill putt, the far side of the cup can act as a backstop if you over-power your putt. You don’t have this safeguard on a downhill putt. Whenever your putt is exactly on the local fall line through the hole, there is no break and your only consideration is judging the speed at which to stroke your ball. For every other location you will have to judge both the speed and the break. As you have to stroke a downhill putt with less force, gravity will act on your ball sooner causing it to break laterally on its run towards the hole. Remember that the slower the speed your ball travels at, the more it will break. Downhill putts are the least forgiving of all putts. When your ball is just off the fall line, it can be difficult to see if the break is left-to-right or right-to-left. Any error in judgement of the correct path will be magnified. The number one tip is to avoid, whenever possible, leaving your ball above the hole. If you can, try to position your approach shot so that you are putting uphill. You should plan for more break as gravity will act sooner on a ball with less momentum. Most golfers under-read the break. It is better to play slightly more break so your ball is at least rolling towards the hole as it dies, and not away from it. Unlike uphill putts where you can putt more aggressively and take out some of the break, this approach is unwise when the hole is below you. In order to avoid a long come-back putt, it is best to die your putt into the hole. Loosen your grip pressure by holding your putter very lightly. Position the ball towards the toe of your putter. (The danger here is that your putterface can twist open with an off-centre contact, causing your ball to start to the right). Choke down on the shaft to shorten the effective length of your putter as this will lessen the energy transmitted to your ball. The solution for gaining confidence is practice. So when you are out on the course you can avoid faults such as playing insufficient break, decelerating through the contact area, and getting the speed horribly wrong.